Thousands and thousands of people across the country have used hypnosis quit smoking programs. For one-on-one sessions, call us today. At the AbsolutePeak Hypnosis center, we are very experienced with this important and life-changing issue. We are successful if our clients become non-smokers. 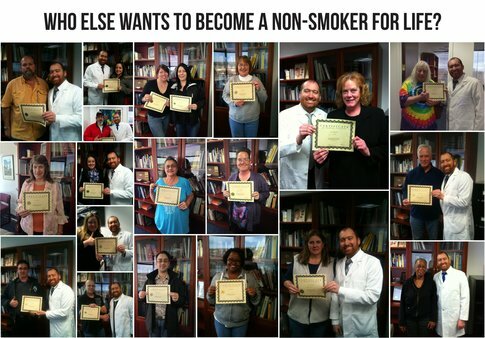 Our hypnosis quit smoking program regularly receives referrals from local physicians that know the effectiveness of our stop smoking hypnosis program. To learn more about how exactly the use of hypnotherapy to stop smoking works at our Cleveland hypnosis center, click here. Here is how our process works. Call us at (216) 916-4646 to ask us any questions you might have after reading all the information pages here on the website. The hypnotherapist will talk to you about the program, learn a little bit about your smoking habit and discuss how you want to quit. You can stop all at once or taper off. The next hypnosis quit smoking session will usually be ten times more powerful and effective than the first session. There are a small percentage of people who do the hypnosis quit smoking program, about 10 percent, that will require more sessions to stop smoking. For that small percentage that need more help, we are there for them too, at no additional charge. Included in this process is a free hypnosis quit smoking reinforcement cassette tape. Most clients tell us that they don't need to use the reinforcement tape, but we give it to you in case, for example, you are going to go out and eat with some of your still-smoking friends. So if you are ready for your own reasons to step up and take control of your life instead of letting cigarettes control you, click here to schedule a FREE phone consultation. We have offices in both Beachwood, Streetsboro and Downtown Cleveland. Email Us A Question Here. To Go To the Top of the Hypnosis Quit Smoking Page, Click Here.